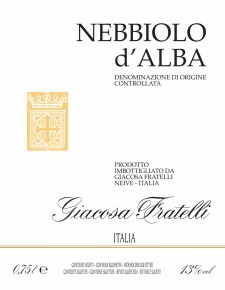 Giacosa Fratelli Nebbiolo d’Alba is made with 100% organically-grown grapes, sourced from selected vineyards in the Roero area (the Northern bank of the Tanaro river). This wine ages 10 months in large oak barrels and a minimum of 12 months in bottle to allow for flavors and complexity to properly blend and mature. Light to medium color typical of Nebbiolo, loaded with notes of violets, roses and spices; lively and fruity on the palate with balanced tannins and acidity. Excellent accompaniment to roasts and grilled meat, foundues and medium-aged cheeses. Grapes are harvested by hand. Vinification in stainless steel at controlled temperatures. Aged for 10 months in large barrels plus a minimum of 12 months in bottle prior to release.